There’s an old saying in golf instruction that says “the divot tells you everything you need to know about a golf shot.” If you’ve got a nice square, shallow divot then the ball went long and straight, right? 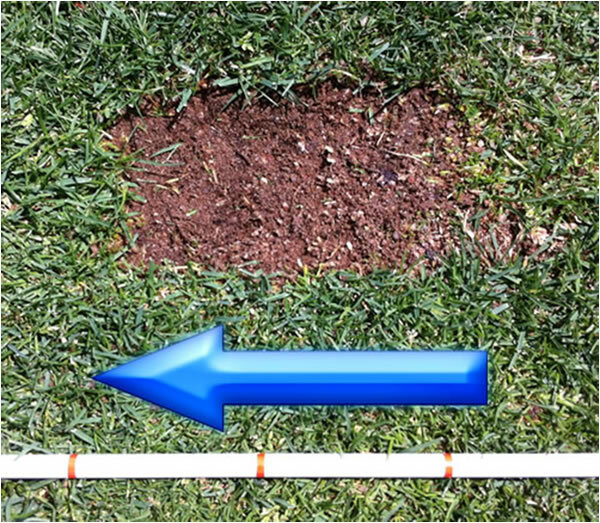 Take a look at the divot below from a professional golfer and try and determine the ball flight. If you guessed that the ball went straight, you’d be sadly mistaken. While this divot is dead square to the alignment stick, the reality is that this shot missed the target by a relative wide margin, and if you had a Flightscope X2, you’d know why. More importantly, you’d know what to correct in your swing. As an instructor who works primarily with professional golfers, correcting the club path/plane and face angle is everything. At the end of the day, my goal for all my students is to have their path to be less than 2* in to out or out to in, depending on their ball flight preference. Because the Rotary Swing Tour fundamentals create a shallow angle of attack, these numbers allow the ball to start on the target line and fly with no perceptible curvature. I mention that because if you have a very steep angle of attack and an in-to-out path, you would need to alter these numbers in order to get the ball to start and stay online. This principle is referred to as the “D-Plane” and is beyond the scope of this article, but a quick Google search will give you all the information you need about the D-Plane. Getting the path “zero’d out” as I call it, or close to square to the target, takes solid swing fundamentals like those that the Rotary Swing Tour advocates and then fine tuning work that can only be done with a launch monitor like the Flightscope X2. If you base what you’re working on in your swing based on ball flight and the look of your divots, as many do, you will likely spend a lifetime chasing your tail looking for one quick fix after the other. The reason is that most golfers don’t realize what factors are actually causing the ball to fly the way that it does. For instance, most better golfers that I with a miss that starts left of the target and goes further left believe they are coming “over the top” since the ball is starting left of their intended line. To “fix” this, they try to swing more out to the right and are then confused as it actually worsens the problem. Put them on the Flightscope X2 and the truth can readily be seen. The reality is that they are actually swinging too far “in-to-out” with a shut clubface in relation to their path. This is impossible to see with the naked eye when you are only talking about a few degrees difference and the divots can still look perfectly square like the one above. The cure is to show them the real numbers on how much they’re swinging in-to-out and set about fixing the path first to get within that critical 2* mark. Any more than that and the ball will tend to start off line and need to curve back unless depending on your angle of attack. Once you have the path “squared up”, the only deviation you have to deal with from there is the clubface angle, which can also now be squared up. Having a square path and square face makes golf dramatically simpler. The closer you are to being “zero’d out”, the easier it is to maintain your swing and the fewer compensations you will have in your swing to hit the ball at your target. 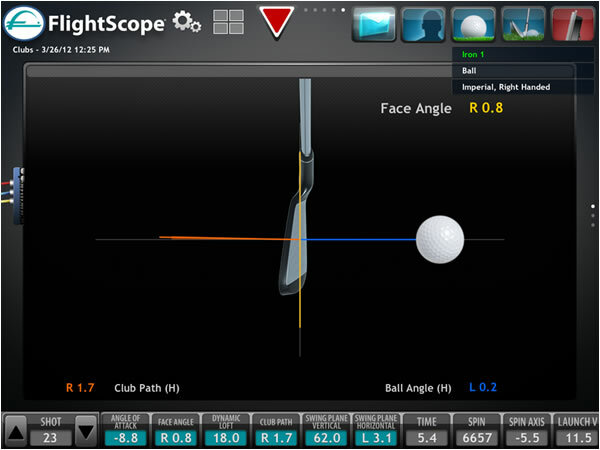 With a FlightScope X2, you’re no longer guessing at these numbers, you’re them in real time to within one tenth of a degree and that’s what makes the X2 a tool that is changing how golfers learn the game. The younger generations of golfers aren’t “digging it out of the dirt”; they’re making real-time corrections to the “real” problem while actually out on the course with the portable X2 looking at the screen of an iPad. If you’re not currently working on your golf swing this way, you might as well be hitting balls the dark. 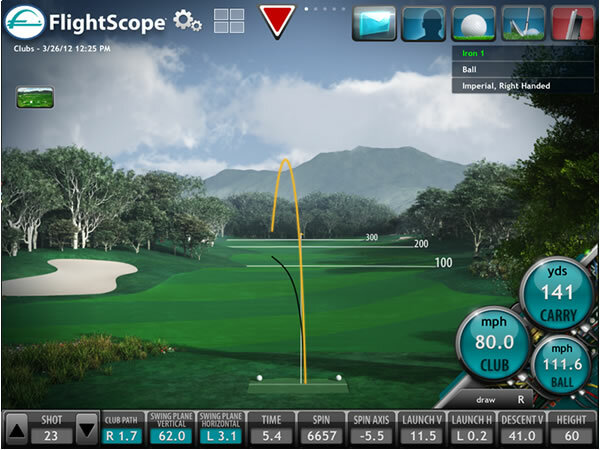 The FlightScope X2 makes reading the data very easy to understand, even for someone new to the technology. In the screen shot below, you can see a shot that was struck with a short iron by a professional golfer. The face angle was only .8 degrees right of the target at impact with the path less than 2* degrees in-to-out. However, the ball still started LEFT of the target line ever so slightly by .2 degrees. Looking at the picture of the divot above, no one would be able to deduce that the ball would end up where it did – 8 yards LEFT of the target from only 141 yards. That’s right, a path that was imperceptibly in-to-out less than 2 degrees with a face angle that was less than 1 degree shut in relation to the path hit a shot that started left and ended up nearly 10 yards offline on a shot that only traveled 141 yards in the air as can be seen below. So, the golfer hit a shot that started slightly left and went further left by slightly swinging to the RIGHT with a clubface pointing RIGHT of the intended target line. If you relied on the naked eye for the ball flight and the divot as instructors had to in the past, it’s very likely that you would start working on fixing your “over the top” move that would have you working to swing even further in to out – a recipe for more frustration. To fix this problem, you must use a launch monitor like the FlightScope X2 as it’s physically impossible to deduce this information from a divot or even a high speed camera. When you’re ready to really fix your swing, visit a golf school like the Rotary Swing Golf Academy in Orlando, FL and Denver, CO to work with an instructor that uses a FlightScope X2. Get Your Free Membership to Watch "Taking a Divot in Front of the Ball" Right Now!